The old map has a water level of -1 with desert also at -1 (looking like beaches on the shorelines), yet the expanded sections generated desert up to level zero. Is there any way to fix this and get my map to expand with the correct climate altitudes? The map was first generated a couple of versions ago and last expanded in the last version, so perhaps that has something to do with it. I assume the original climate settings got replaced. Do you also have problems when raising/lowering landmasses? You should be able to access the settings with the menuconfig, change the climates in the landscape tab to represent what's on your current map and then expand. Make sure to backup the map before trying! 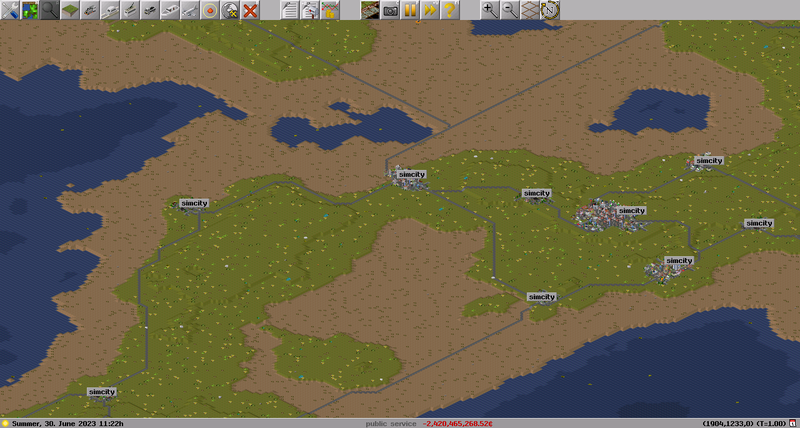 There was an error with wrongly calculated climate offsets during map generation in older Simutrans version. If that map was generated with an older version, then the climates would not have started at the heights they were intended to. There is almost nothing one can do there, because the old calculation was just wrong for negative offsets, and thus needed fixing. I've never managed to get one of my maps back into shape, even by editing the climate offsets using the dialog I think Leartin is referring to. Maybe I opened it the wrong way, though. In response to Ters, I got it to work by changing the climate settings, saving the map, quitting and loading the map again and then expanding the world. Maybe I never tested again after saving and loading.